Signs of Summer 3: Stink Bugs! 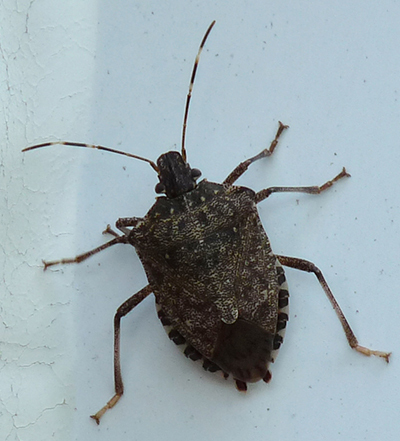 As we have talked about before, the brown, marmorated stink bug (scientific name: Halyomorpha halys) is a native species of northeast Asia (Japan, Korea, and China) and has become over the past 20 years a serious invasive pest throughout the United States. It is thought that this insect was first released into the United States in Allentown, PA in 1996. It apparently traveled from northeast Asia in a shipping container that was delivered either to the port of Philadelphia or Elizabeth, New Jersey and then trucked to Allentown. Five years later this new, alien, invasive species was recognized and identified by entomologists at Cornell University, but by then large populations were being observed throughout eastern Pennsylvania, New Jersey and New York. This insect has now spread to forty states and is especially abundant in the eastern United States. It has very large populations in Pennsylvania, Maryland, Virginia, New York, New Jersey, Massachusetts, Delaware, Ohio, and North and South Carolina. Its spread to California and Oregon was allegedly via a car driven by a person traveling from Pennsylvania to California in 2005! The ability of these stink bugs to overwinter is remarkable. There is some mortality among the hibernating bugs, but a significant percentage of them make it through to spring and to their opportunity to mate. A mated female is then able to lay up to three hundred eggs! The relative severity of the winter does, however, affect their percentage of survival. Several models of climate change and global warming have included increased survival of stink bugs at higher and higher latitudinal locations with, then, significantly larger spring and summer populations of this potentially destructive pest. Many of these stink bugs find their way into our houses and spend the winter months hibernating in tiny crevices and hideouts all around us. Their periodic emergence throughout the winter is our only reminder that they are close by! Brown marmorated stink bugs feed on over one hundred and fifty plant species including a number of crops that are of great economic importance to humans. Fruit trees (especially apple and pear), soybeans, and peanuts are crops significantly damaged by these insects. I have also seen stink bugs in my yard feeding avidly on the grapes growing on my grape vine. 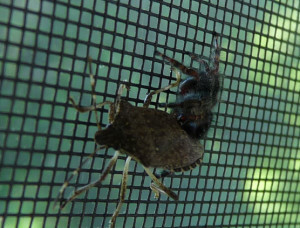 When these stink bugs first made their appearance here in Western Pennsylvania most potential predators were actively repelled by their pungent scent. Spiders, birds and almost every other type of possible insect eating invertebrate and vertebrate species actively avoided contact with the stink bugs, and, subsequently, their populations grew out of control. In the fall of 2013 and in the spring of 2014 we caught thousands of stink bugs in and around our house. We filled up dozens of one liter, plastic bottles with their carcasses! Over the past two years, though, we have not experienced these huge fall and spring outbreaks! This spring I have caught maybe twenty or thirty total stink bugs (I haven’t even filled one plastic bottle yet!). A far cry from the thousands of 2013 and 2014! What has happened? It may be that predators are adapting to the noxious scents of the stunk bugs and are reducing their effective populations! We have observed spiders actively trapping and eating them. The picture Deborah took of this jumping spider chewing its way into the captured sink bug is a great visual of arthropod control! Birds (especially titmice and chickadees) regularly flare up to the window screens of my house and snag unwary stink bugs. They fly them over to nearby branches and gobble them down! (Go chickadees! )The predator guilds of our surrounding vertebrate and invertebrate communities have apparently adapted themselves to this new (and formerly incredibly abundant) food source! Control has been achieved, at least in the area immediately around my house! A few months ago an old friend, Karen Shaver, sent me a link to an article about predators of brown marmorated stink bug eggs. The article (published in the journal Biological Control) was written by Rob Morrison (a research scientist at the USDA-ARS Appalachian Fruit Research Station in Kearneysville, WV). Morrison and his colleagues tested twenty-five potential arthropod predators of stink bug eggs and found several that voraciously devoured the egg masses. Katydids, crickets, ground beetles, jumping spiders and earwigs all actively ate the stink bug eggs (it is especially nice for me to see earwigs talked about in a positive manner! (See my essay about earwigs in my July 23, 2014 Signs of Summer #7 blog!)). Morrison’s group emphasized that modifying habitats to encourage the growth and abundance of these egg predators might be a very effective, long term way to control the populations of this potentially destructive crop pest! 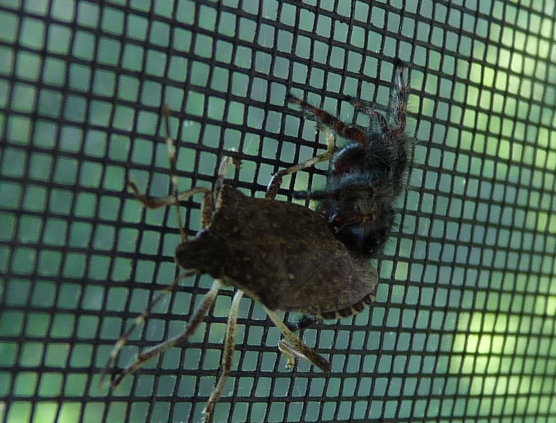 So the brown marmorated stink bug is still with us, but it seems to be getting under control mostly through ecosystem adaptations to its presence and to its potential as prey and food for both vertebrate and invertebrate predators! 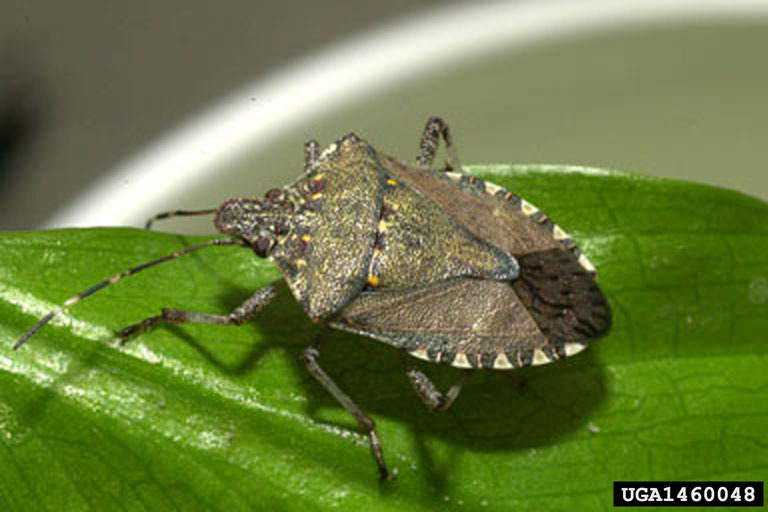 Pesticides have not been terribly effective in preventing crop damage by stink bugs primarily because of their mobility (they hide in vegetation away from the treated field crops and then swoop in to feed thus limiting their exposure to the applied pesticides). The new observations of active predation of adult bugs and their eggs by an array of arthropod species might indicate that non-targeted destruction of crop dwelling arthropod predators via the pesticide treatments might actually make the stink bug infestation worse! So, stink bugs are a relatively new and not terribly pleasant sign of summer for Western Pennsylvania. Fortunately, our surrounding biotic community is hard at work to keep them from being the ONLY sign of summer and fall that we notice!